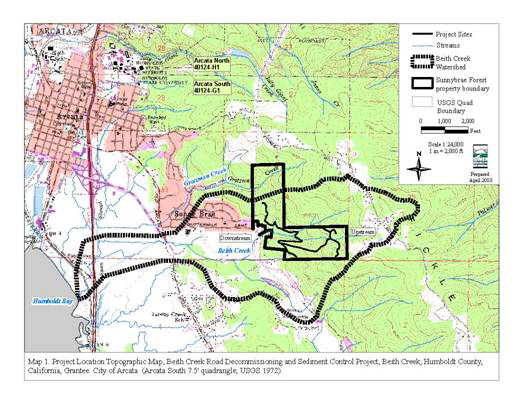 This map shows the legacy logging roads in the Sunny Brae Forest/Beith Creek Watershed which have been removed. Courtesy City of Arcata. SUNNY BRAE FOREST – When the City of Arcata took possession of the Sunny Brae Forest, it still bore all the scars of decades of aggressive logging. These include logging roads and primitive creek crossings dating back to the 1940s. While it isn’t ready for safe public access yet, some of the damage has now been reversed. 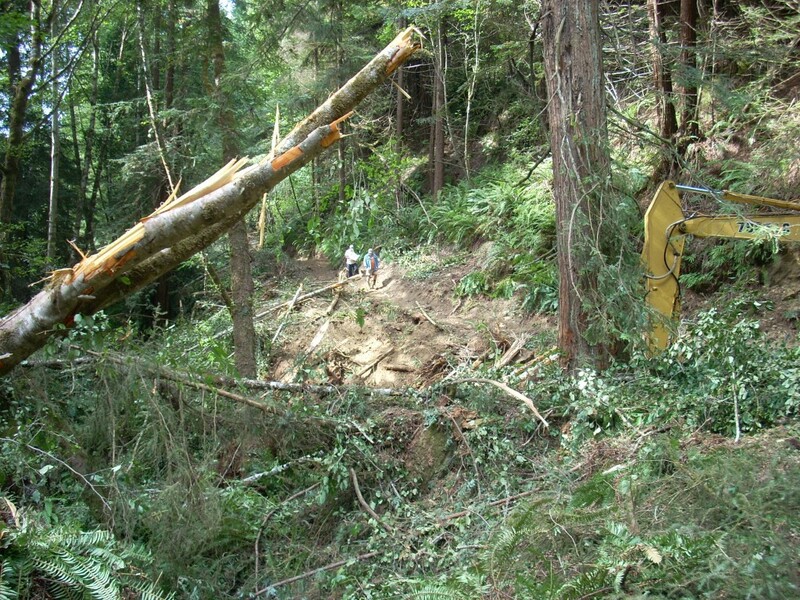 Some 1.2 miles of logging road and nine unstable Beith Creek stream crossings have been removed in a project funded by the state Dept. of Fish and Game’s Fisheries Restoration program, the federal Fish and Wildlife Service and the City of Arcata. Not built to modern standards, the unpaved roads were removed, with a narrow, four-foot “bench” left for forest access, maintenance, tree planting and as a basis future trail building. The areas were mulched and will be revegetated in future volunteer work days. The old stream crossings posed a threat of collapse, with built-up sediment threatening to engulf downstream habitat. 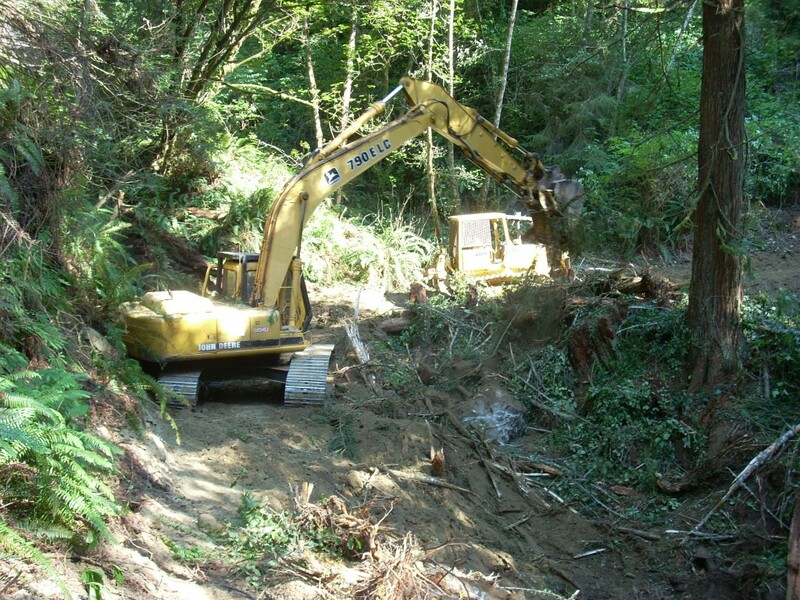 “From what I saw up there, some of the finest trails in Arcata will be in the Beith Creek area, for quality of experience,” said Environmental Services Director Mark Andre. Following more maintenance, plantings and once nature takes its course, the former roads will become some of Arcata's most beautiful forest trails. Courtesy City of Arcata. The Forest Management Committee will schedule a publicly attendable walk-through in November, beginning at Fickle Hill Road, going through the newly acquired Morris Property and ending on Margaret Lane in Sunny Brae sometime in November. This entry was posted on Tuesday, October 18th, 2011 at 9:24 am	and is filed under News, Environment. You can follow any responses to this entry through the RSS 2.0 feed.